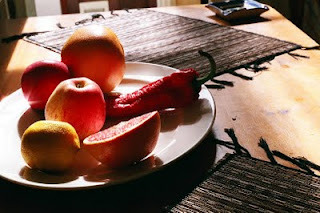 I know it may seem boring - another picture of just fruits. But fruits are superb. Not only for the health benefits but the way they exist, their color, shape, taste. Each called the same name - apple, orange - but each of them so different. Hmm, sounds like a pretty healthy life style. Wait a moment, what is this ashtray doing there? ?